December 21, 2010 - Federal Aviation Administration (FAA) safety inspectors at the North Pole certified Santa One, the reindeer-powered sleigh piloted by Santa Claus, for its Christmas Eve round-the-world delivery mission. ?Children around the world will get their gifts on time, regardless of the weather, thanks to NextGen,? said U.S. Transportation Secretary Ray LaHood. ?We?re proud to say NextGen is bringing Santa Claus to town.? Rudolph?s red nose has been outfitted with avionics that will broadcast Santa One?s position via satellites to air traffic controllers around the world with improved accuracy, integrity and reliability. ?Santa?s cockpit display will help improve his situational awareness by showing him and his reindeer flight crew their precise location in relation to other aircraft, bad weather and terrain,? said FAA Administrator Randy Babbitt. ?NextGen will help make this an extra-safe Christmas Eve.? The sleigh?s onboard systems have been upgraded with state-of-the-art, NextGen technology that will allow Santa One to maintain cruising altitude for as long as possible before making a continuous descent into cities and towns around the world. While maneuvering on rooftops, an advanced, onboard runway safety system will help reduce the risk of incursions between the sleigh and chimneys. Santa?s reindeer-powered sleigh is already energy-efficient, but the NextGen technologies will further reduce Santa One?s carbon hoofprint. The shorter, faster routings means that Rudolph and the other reindeer will consume less hay, resulting in fewer greenhouse gases. Unlike any other pilot, Santa has special permission from the FAA to fly thousands of domestic and international short-haul and long-range flights in one night. In keeping with the FAA's science-based proposal to give pilots more rest, Santa will arrange his flight plan based on his circadian rhythm. Mrs. Claus also assured FAA safety inspectors that she?ll make sure he gets plenty of rest before the flight on Christmas Eve. 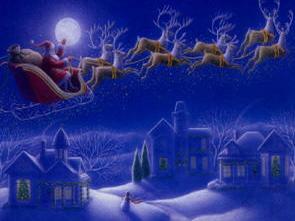 Follow Santa?s progress on Christmas Eve at the NORAD Tracks Santa website. See how NextGen is going to improve the safety and efficiency of Santa?s rooftop descents.